This summer…a major Valiant hero will fall as the countdown to HARBINGER WARS 2 begins! As revealed today at Emerald City Comicon 2017, Valiant is proud to announce “MASSACRE” – a new, four-part assault beginning this July in HARBINGER RENEGADE #5! This summer, THE ROAD TO HARBINGER WARS 2 – Valiant’s seismic 2018 crossover event – starts here as multiple Harvey Award nominee Rafer Roberts (Plastic Farm) and superstar artist Darick Robertson (The Boys, Transmetropolitan) bring a newer, deadlier, and brutally efficient H.A.R.D. Corps crashing down on America’s renegade team of teenage superhumans! 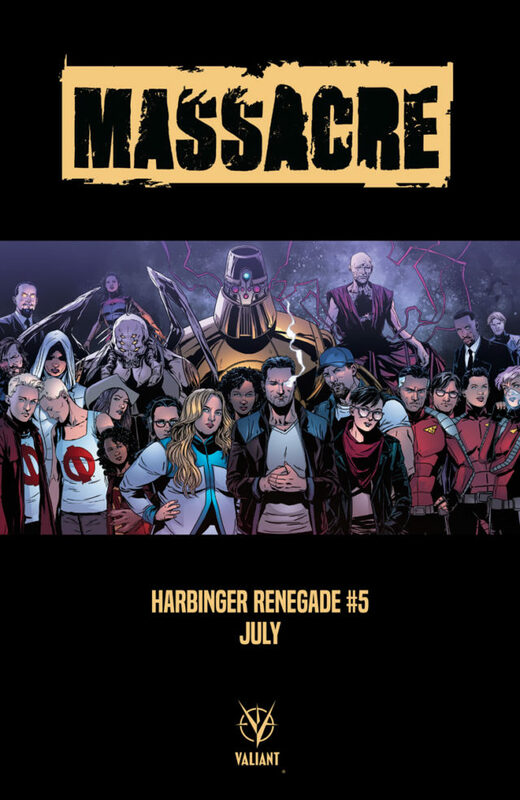 Plus: Also coming in the pages of “MASSACRE”…discover the true face of the antagonist that will bring HARBINGER WARS 2 to bear in 2018! 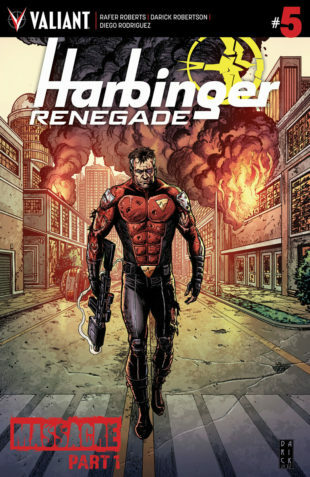 The first appearance of Valiant’s most formidable villain yet happens right here, only in HARBINGER RENEGADE #5! For more on what awaits in “MASSACRE”, join writer Rafer Roberts alongside Valiant Editor-in-Chief Warren Simons and Valiant CEO & Chief Creative Officer Dinesh Shamdasani this weekend for the VALIANT: THE ROAD TO HARBINGER WARS 2 panel presentation on Sunday, March 5th at 2:30 p.m. PT in room TCC301! $3.99 | 32 pgs. | T+ | COMING IN JULY!